Over the past year, most of my friends have heard me rave about my nephew Corbin. I absolutely love being an auntie! Because of Nick's accident and MANY doctor's appointments and hospitalizations, I've had a lot of bonus time with this nephew. As I put in his birthday card, he was a ray of sunshine when our family needed it most. I can't begin to tell you how much happiness his precious smile has brought to us all! 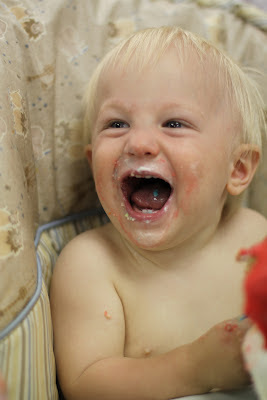 This past weekend, on the coldest and rainiest day in May, we celebrated his 1st Birthday! Nothing, not even the weather, could take the joy out of our party. We spent the day as family, enjoying one another's company. Here he was at about four weeks old. Here he is, one year old, enjoying is smash cake! Happy 1st Birthday baby boy! We all love you to pieces!! !